I figured our first trip as expats in Bangkok would be to someplace else in Thailand. 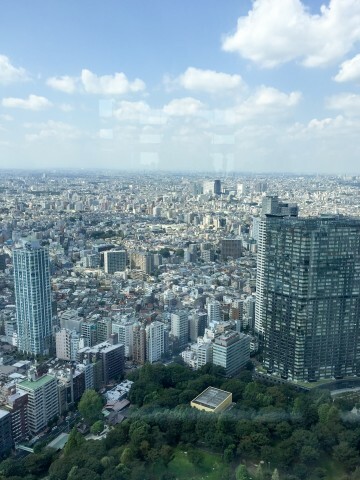 Maybe Krabi, Phuket or Chiang Mai, however we ended up going to Tokyo instead. The cool weather in Japan was a welcome change from the humidity and heat we were experiencing in Bangkok. 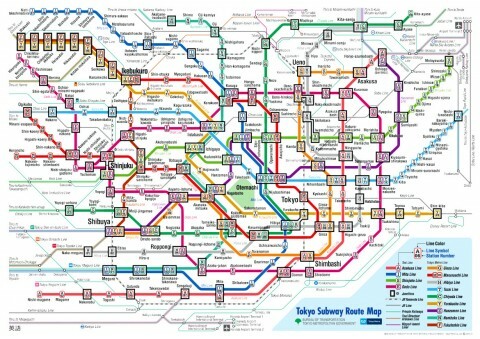 Not to mention the fact there are plenty of sidewalks in Tokyo, which makes for easy stroller rides. Oh yes, I’ve become one of those people who partially judges their trips based on how toddler friendly they are! The flight from BKK to HND was about six and a half hours. And while this may seem like a daunting flight with a toddler it was a total breeze. I’m fairly certain we used up all of our ‘good travel karma’ on this trip … or maybe it was a gift for being good troupers on the trip from DC to Bangkok. Either way I’m super thankful for Jellybean’s impeccable behavior both on the way there and on the way home. 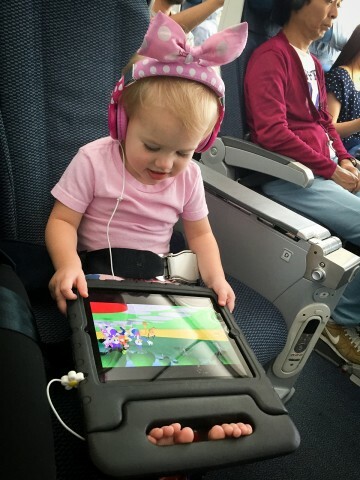 She spent most of the time on the flight playing with her apps on the iPad or watching Mickey Mouse Club House. Our family rule is there is no limit to screen-time or snacks on a flight. Happy toddler = happy parents AND other passengers on the plane. Luckily, with a little help, we were able to navigate to our hotel. If we go to Tokyo again I am taking a taxi from the airport to the hotel. Trucking a toddler and multiple bags up and down stairs to transfer lines (there are limited escalators/elevators) was a bit much. Tip: Invest in a SIM card and data plan. We didn’t get a voice or texting plan. Just the data plan, which came in handy for navigating the city and looking up places to eat. 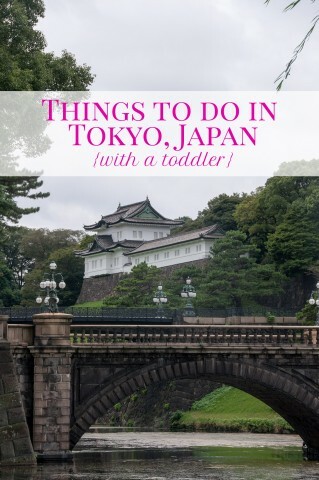 Here’s what we did while we were in Tokyo, which for the most part was very toddler friendly! 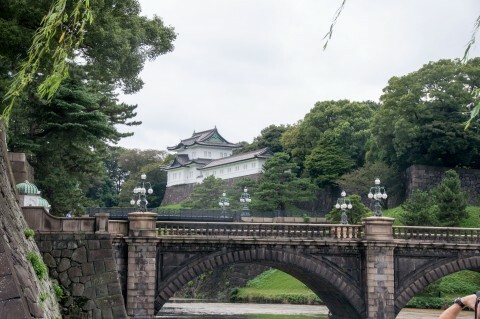 This is the is the primary residence of the Emperor of Japan. The interesting part about it is you can’t actually go in the palace nor can you get close to it. The palace looks beautiful from a far and the surrounding park make it worth a visit. Sumo was a tad bit slower than I thought it would be. There was a lot of walking around each other and squatting. My favorite part was when Jellybean kept screaming “go baseball! go baseball!”. My kid cracks me up … apparently in her mind all sports are baseball. Since she’s wasn’t even two we will give her a pass, but as her mother I plan to tell this tidbit for FOREVER! And, that includes at her wedding. This was pretty cool though I didn’t have the chance to enjoy it at much as I would have liked. Jellybean was running around like a mad woman. Despite trying to get her to look at all the buildings and the skyline her attention only lasted a few seconds. After catapulting herself out of my arms and onto the floor she was off to the races. It was cool to watch the crowds cross the street in different directions. Many other tourists were also waiting for their turn for a photo opt, so I’m pretty happy with how this picture of the hubby and I turned out! The write up in the travel book described this zoo a kind of ‘sad’. I would have to say I agree. The cages were somewhat small and the animals didn’t seem happy, so to speak. That said Jellybean and I did have a good time. She was ecstatic to see the elephants and the rhino was probably her favorite. 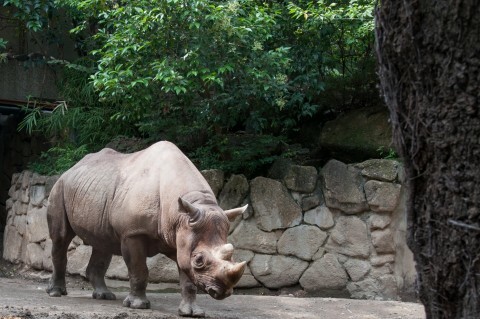 The rhino love was probably a result of one of her favorite bedtime stories, I Know a Rhino. If you don’t have kids, I would suggest skipping the zoo. Absolutely beautiful place. We had a great time walking around and taking in the scenery. It was the perfect place to take a toddler who loves to run free and you are still able to take in the sights. 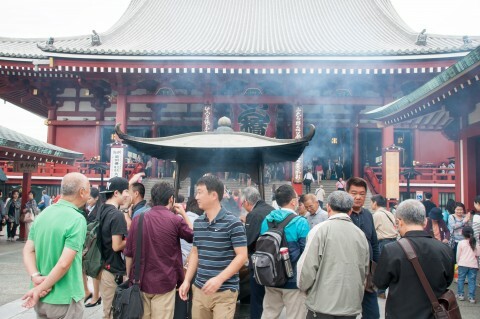 The day we went to see Asakusa and the Senso-ji temple it was gloomy and started to down pour as we were heading back to the train. Despite the dreary weather the place was packed with tourists and luckily didn’t take too long to tour. Have you been to Japan? 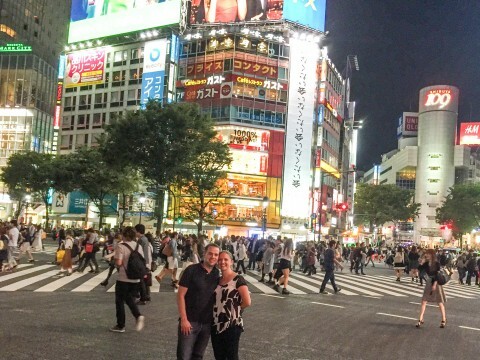 Where else in Japan would you recommend visiting? Oh wow this looks really amazing! I’m glad you had a good time. 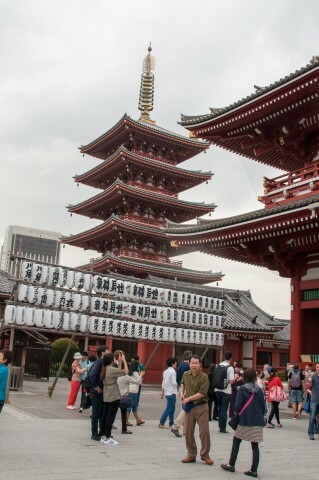 I’ve not been to Japan and to be honest I’m not sure I fancy it, the busy-ness of it all scares me! 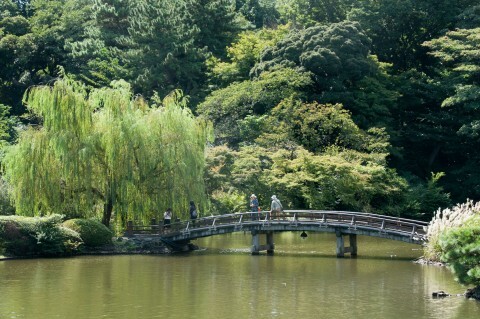 Love all of the pictures, Japan is so beautiful! Isn’t amazing when our kids behave on the airplane! 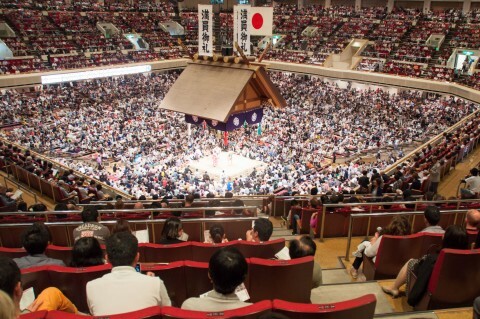 I’ve never been to Japan but I would love to go.